✔ How do I get clear on what is my passion? ✔ Who does my passion serve? ✔ How do I position myself so that I can get in front of those who need what I have to offer? ✔ How do I leverage my time and resources to maximize opportunities in front of me now? ✔ What strategies do I use to effectively reach my target audience with my message, service and products? ✔ How do I overcome obstacles, objections and closed doors that keep me from moving forward? 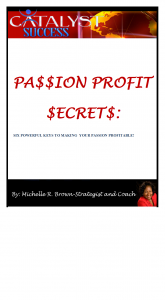 Download this *FREE* report to transform your passion into a profitable business starting today!